Citing her parents as her main driving force, Safiyyah Iqbal says her proudest moment was, “seeing my parents smile as I graduated for my BSc, BSc honours and MSc” degrees. “They have always believed in my capabilities and as they have been my role models, they have always influenced me to always give my very best,” she says. Giving her very best has certainly seen the 27-year-old reaping the rewards. Currently a PhD student at the Wits University Evolutionary Studies Institute (ESI), Iqbal completed an undergraduate degree in 2012, majoring in animal, plant and environmental sciences. “I then furthered my studies by completing my BSc honours in 2013 and MSc degree in 2014 in palaeontology at ESI, where my research was the first quantitative study on the forelimb of a non-mammalia form cynodont, thrinaxodon liorhinus. 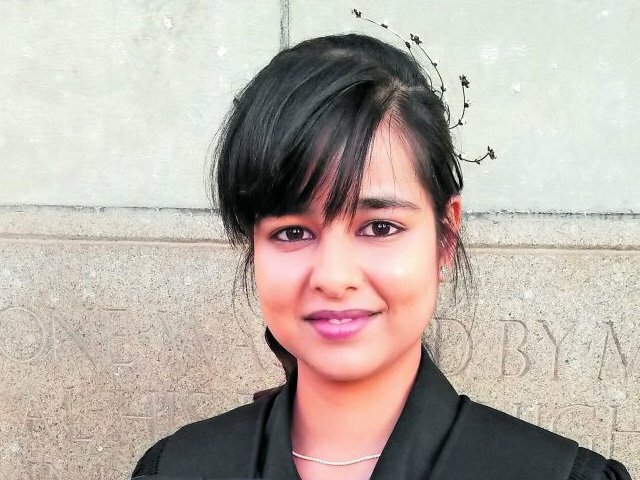 At present, I am finalising my PhD, which features a multidisciplinary approach that is the first in this field by combining palaeontology and mechanical engineering through emphasising the application of finite elements analyses in studying the functional morphology of fossils,” she says. Not only a regular participant at conferences (like the Imaging with Radiation: 1st South African Biennial Conference, Palaeontological Society of Southern Africa’s Biennial Meeting and the African Light Source conference and workshop held in Grenoble, France), Iqbal is also passionate about ESI’s outreach programmes, Sci-Bono and Yebo Gogga. These programmes, she explains, “allow fellow scientists to be aware of the research that ESI provides in the day and age of new technologies”. Her hard work and passion are made remarkable given that, as she concedes, “my journey to where I am today was faced with life challenges”.